Home » Linux Distributions » A new version of AV Linux, a Debian-based distribution featuring a collection of audio and video applications, has been released. A new version of AV Linux, a Debian-based distribution featuring a collection of audio and video applications, has been released. AV Linux is a Linux-based operating system aimed for multimedia content creators. Available for the i386 and x86-64 architectures with a kernel customised for maximum performance and low-latency audio production, it has been recommended as a supported Linux platform for Harrison Mixbus. AV Linux is bundled with software for both everyday use and media production. As of AV Linux 2016, AV Linux gets its software packages from the KXStudio repositories, which are compatible with Debian, and therefore AV Linux. This reduces duplication of effort and allows the effort focus to be on a solid base distribution suitable for audio production. For this reason, AV Linux 2016 development has focused more on the base distribution than bundling it with large amounts of software, as it did with previous versions. Instead, the 2016 edition leaves it up to the users to decide what they want to install from the large repository of software available via KXStudio. Preinstalled audio software includes: Ardour, Audacity, Calf Studio Gear, Carla, Guitarix, Hydrogen and MuseScore. Preinstalled graphics programs include: GIMP, Inkscape and Shotwell. Preinstalled software for video editing, playback, capture and 3D animation include: Blender, Cinelerra, Kdenlive and Openshot. For typical day-to-day activities there are several programs available including Firefox and LibreOffice Suite. 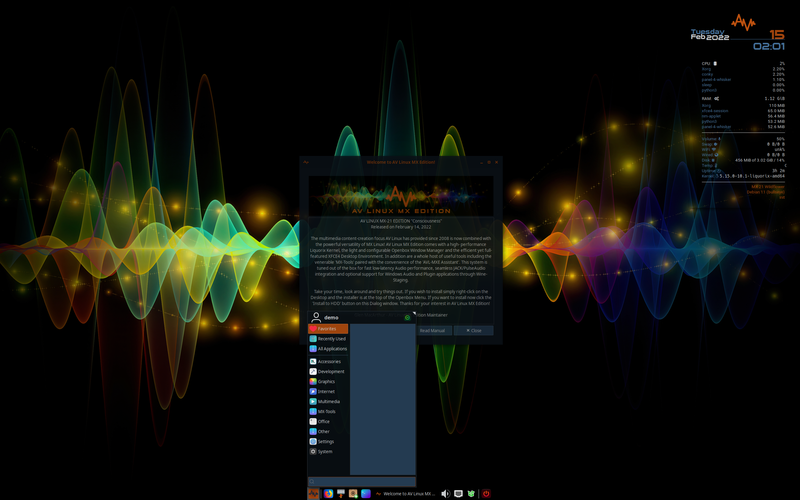 A new version of AV Linux, a Debian-based distribution featuring a collection of audio and video applications, has been released. Version 2018.4.12 comes with various bug fixes, software updates and firmware additions: "AV Linux 2018.4.12 has been released. Bug fixes: updated 4.9.76 real-time kernel with KPTI 'Meltdown' security patch; KPTI can be disabled at boot; numerous important fixes to compatibility with KXStudio repositories; updated and fixed outdated Cin 5.1 and Spotify repositories; WineASIO now works properly; removed GRUB Customizer because it doesn't work on UEFI installations. New additions: ISO files now have accompanying MD5 and SHA256 files; optional 'lowlatency' kernels (required for proprietary video drivers); optional 'SGFXI' proprietary video driver install; UEFI install; Wine-Staging replaces Debian's Wine packages, WineHQ repositories have been added; added firmware for Echo audio devices; dynamic CPU frequency adjustment (in 'Settings' menu); real-time quick configuration scan to check system tuning...." Read the rest of the release announcement for a full changelog. Download: isotester-avl64-2018.4.12.iso (3,536MB, SHA256, pkglist, username: isotester, password: avl64).